Had her own spot, Bambu. I hoped that this remarkable resume would translate into a remarkable burger. Parking was free in the attached lot. The process was simple: order from the menu board and pay at the register; get a beverage at the self-serve fountain; find a table and sit down; wait for the meal to arrive at the table. I ordered the eponymous double Shaka Burger, a side of Parmesan Fries, and a soda for just under 15 bucks. My order was ready within 7 minutes. The Beef: Meh. The beef was nearly characterless. Each patty was 4 ounces. The beef was grass-fed Angus. I assumed that the beef was pre-ground, pre-formed, previously frozen Chuck, because it was insipid and a little rubbery. 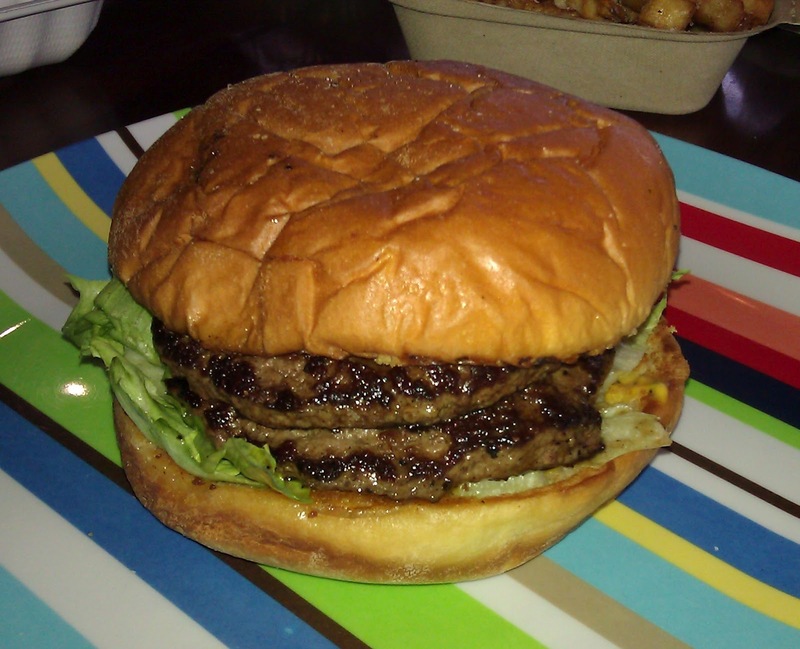 The burger at Shaka Shack Burgers lacked any strong beefy flavors. It did carry a mild note of funk and a faint note of iron. 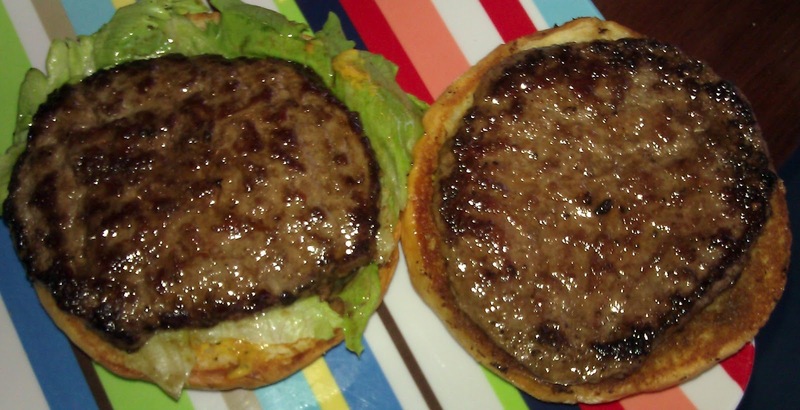 The somewhat chewy burger patties probably came in at about 25% fat--they were on the oily side. The quality was akin to In-N-Out, but for a slightly higher price. The Seasoning: The only thing that I could detect was pepper. That was unfortunate, because the bland beef at Shaka Shack Burgers was in dire need of a savory note or two. The Sear: The sear on the oily patties was sufficient to crisp the edges. However, the patties were thin enough that they became convex as they cooked, and this did not allow a proper and even sear across the entire surface. The Preparation: There was not much to discuss in terms of preparation, since it appeared that the beef arrived at Shaka Shack Burgers in the form of frozen, pre-formed discs. The burgers were cooked to a hot Medium. The grind was medium. The burgers were cooked on a gas-fired flat-top. The Cheese: There was none...sigh. Shaka Shack Burgers served up a burger that was in desperate need of all the help that a thick slice of American cheese could have offered. The cheese would have added texture, umami, savory, and much-needed moisture to offset the oiliness. The Bun: The bun was a sweet, soft, barely toasted version of a Hawaiian Roll. The sweetness was not matched with any savory notes, so the bun fell flat. The Meat To Bun Ratio: In the case of the double burger, this was just fine. The Toppings: The Iceberg lettuce and tomato were both ripe and fresh. The Secret Spot Sauce was a peppery and slightly mustardy version of the sweet mess that we have come to expect from In-N-Out. The Fries: Since the fries were crinkle cut, it seemed safe to assume that these also arrived on a truck, frozen in bags. That said, the fries were fine--they were better than the burgers at Shaka Shack Burgers. 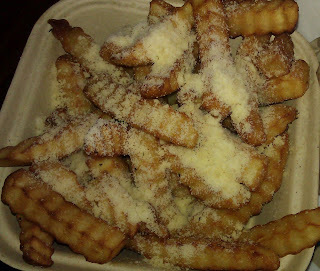 The fries were golden brown, crisp, creamy on the inside, and they were covered in finely grated Parmesan cheese. The Parmesan Fries at Shaka Shack Burgers were a winner. That was sad since the word "burgers" was in the name of the place. The Value: 15 bucks for a something not quite as good as In-N-Out and at twice the price was a weak value. Shaka Shack Burgers was a clear misfire on the part of chef Lisa Stalvey. It seemed that quality, delicious burgers were not in the wheelhouse of this chef and/or this establishment. You can't win 'em all. Burger Review : Hang loose with burgers elsewhere. Shaka Shack Burgers served up an inferior and over-priced version of In-N-Out. Besides the thorough reviews, you take really good pictures. It can feel awkward taking pics of one's burger at a food joint, but you always come through. 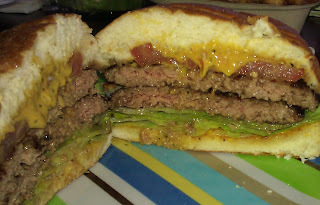 Many burger reviews don't even include one picture. Thanks, Peter! I use an EVO Shift 4G...it takes great photos, and the flash is really good. I am thinking about upgrading to the Galaxy S 2 in a couple of months.